Elizabethton and Carter County, originally known as the Watauga Settlement, were first settled in 1769. Located on the Watauga River and centered around the Sycamore Shoals river crossing, this was the first of four permanent settlements located west of the Appalachian Mountains. Carter County was established in 1796 when Tennessee achieved statehood and was named for Landon Carter, the son of John Carter, one of the first settlers. Elizabethton, the county seat established in 1799, was named for Landon's wife, Elizabeth Maclin Carter. Stretching across the beautifully flowing, clear and cool water of the Doe River, Elizabethton's Covered Bridge is one of Elizabethton's premier and most photographed attractions. It is one of two bridges in Tennessee identified by a Tennessee Historical marker and is included on the National Registry of Historic Sites. 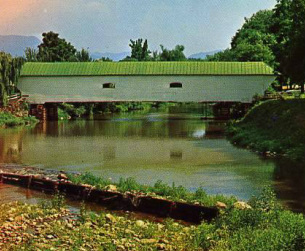 Built in 1882, the Covered Bridge is believed to be the oldest such bridge that is still in use for pedestrians. Constructed at a cost of $3,000 by contractor Dr. E. E. Hunter, George Lindamood and three carpenters, it spans the river for 134 feet, resting on earth and limestone abutments. Hunter hired Colonel Thomas Matson, who had engineered the elevated railroad tracks in New York City, to design the bridge and serve as construction chief. The original structure was made entirely of wood; mainly mountain oak and white pine beams that were hauled down the steep slopes of the mountains by draft horses and mules, weatherboard of mountain poplar, and shingles cleaved by mallet and form chestnut. Hand forged steel spikes and hand threaded bolts fastened together the massive pieces of oak flooring. Termed an "engineering feat" and listed in the Historic Engineering Record, the Covered Bridge survived numerous floods, including the great flood of 1901, which destroyed all the other bridges in the county that crossed the Doe River. Blueprints of the Covered Bridge with Dimensions. This is the earliest photo that the CCH staff has been able to find of the Covered Bridge. As you will notice, there were no windows in the bridge at the end of the 1800's. The Elizabethton Covered Bridge is located in downtown Elizabethton, the county seat of Carter county (Elizabethton Quad, 207 SW). Connecting 3rd Street and Hattie Avenue, the bridge is adjacent to a city park and spans the Doe River. As the county seat, Elizabethton grew throughout the 1800s. However, Lynn Mountain hemmed it in to the east and the Watuaga River lay to the north. The Doe River flooded often and limited growth to the south. To span westward, to the site of the current downtown, the city would need a bridge over the Doe River. After extensive debate, in 1882 the County Court approved $3,000 for the bridge and $300 for approaches. The court appointed a committee to select a site for the bridge. However, the committee encountered an unexpected problem - the men could not find a qualified contractor to erect the bridge. After county officials were unable to find a bridge contractor, a local doctor, E.E. Hunter, accepted the contract and hired experienced people to work on the bridge. Hunter selected Thomas Matson, who had been an engineer for the Narrow Gauge (Tweetsie) Railroad as an engineer and architect. Hunter referred to the bridge as his "$5 bridge" since he made a profit of $5 as contractor. Although logs from a lumber operation and a barn were thrown against the bridge and its supports during a disastrous flood in 1901, this was the only major bridge in the area to survive. Most of Elizabethton's downtown is listed on the National Register of Historic Places for its historical and architectural merits. The Elizabethton Historic District contains a variety of properties ranging in age from the late 1700s through the 1930s. However, the Elizabethton Covered Bridge is a focal point and a well-known landmark in the state. In addition to this bridge, the district also contains a significant 1926 concrete arch bridge over the Doe River. Structurally, the bridge contains one span, a covered wooden Howe Truss that is 137 feet long. The total length is 154.3 feet. The bridge contains one traffic lane and a single walkway. The curb-to-curb width is 16.4 feet and the out-to-out width is 20.4 feet. The substructure is masonry stone and concrete. Each end of the bridge features a projecting truncated gabled roofline. Below is vintage video footage of the Elizabethton downtown area back in the late 1960's. The video shows a frozen Doe Rive and a snow laden Covered Bridge. You will also see other landmarks such as the old Lynn Ave. School and the Tweetsie Water Tower as it sat by the tracks on West Elk Avenue. Each year the Elizabethton Fire Department decorates the Covered Bridge for Christmas. A small raft is launched with two firemen and a large wreath that is placed on the northern face of the bridge just in time for the Christmas Parade.